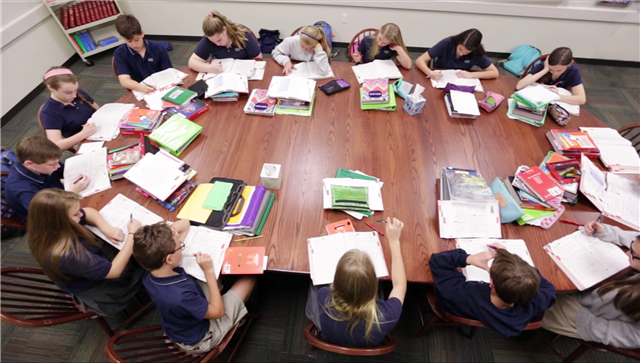 In the middle school at SBS, our teachers encourage critical thinking, collaboration and student engagement through Harkness learning in our English, Bible and social studies classes. In order to prepare for a class discussion, students read and annotate a shared artifact, such as a text, which they examine collectively as a group. Working together, students have the opportunity to pose questions, share perspectives and enhance their understanding of the topic by participating in meaningful academic discourse with their peers. During this time, teachers serve as facilitators and coaches, who carefully provide additional guidance and perspective. Ultimately, through Harkness learning, our students and teachers join in a collaborative effort to deepen understanding. Our teachers are trained in the mindsets and strategies associated with Harkness learning. This method provides an opportunity for students to assume greater responsibility in academic conversations. The focus is not just on preparing students for college, but also preparing them for social and professional environments outside the classroom well into adulthood.